Shadow of War is a massive game, and jumping into it can feel daunting. Here’s what you need to know to build a lasting, memorable relationship with your new orc buddies. 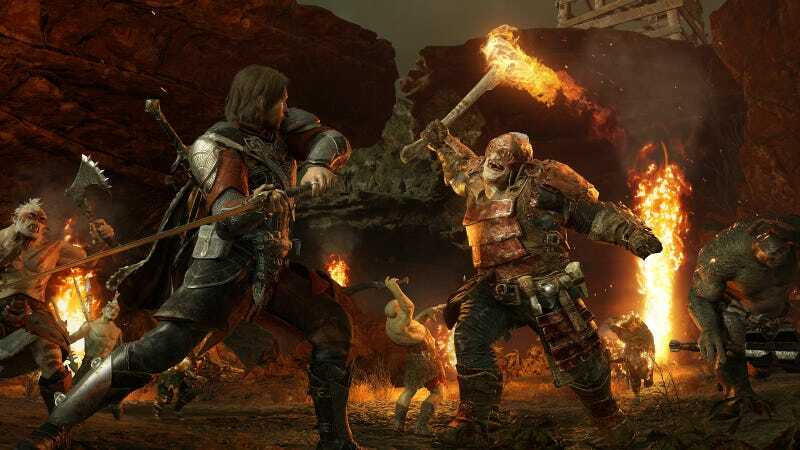 While you should chip away at the main quests from time to time, especially for the first act of the game, Shadow of War’s story is not the star of the show. Take time to explore the world. Meet as many random orcs as you can, because they will end up being the most memorable part of the experience. Whenever Talion dies, Shadow of Mordor’s internal clock presses forward. If an orc killed you, they will move up in rank and become stronger. Other orcs out on missions will have their quests resolved, or die in the process. Orcs shift on the totem pole, or learn new tricks. While the game always lets you come back from death, every change that happens as a result is permanent. You can’t just reload an earlier save. So, try not to die...unless you want the nemesis system to work its magic. Things like quests, Mirian, intel, collectables and more will be denoted here. The minimap also makes things like following orc tracks way easier. The first thing you should do on any new map is track down the Haedir so that you can do its little mini-game. Once you find all the points of interest at the Haedir, it will turn into a fast travel point. Different play styles will prioritize different skill unlocks, but some abilities are better than others. It’s a good idea to start by getting all the wraith skills. From there, you’ll want Caragor and Graug riding, fire detonation, freeze pin, shadow strike, elven ability, ground finisher, and of course, executions. I particularly love Hammer of Eregion, which freezes any enemy that you vault over. Information is your strongest weapon in Shadow of War. Before you take on any orc, make sure to press the “details” button. Here you will find an orc’s strengths, weaknesses, fears, and immunities. Keep all of that in mind before you head into battle: you don’t want to make the mistake of wasting a powerful move just to find out your target is immune to it. Pay particular attention to vulnerabilities that either daze or heavily damage your opponent, and exploit the hell out of them during battle. Look around you. What do you see? Make use of it. Every area will have something Talion can weaponize, including fire, spider nests, caragor pens, and more. If your target is immune to any of these environmental elements, it’s still good to be aware of them, because that stuff can harm you, too. The shadows are your friends. It’s easier to tackle an outpost without getting swarmed if you take out enemies one-by-one for as long as you can. Here, the “attract” ability, which calls orcs to you, is particularly useful. It’s worth noting that suspicious enemies are denoted by yellow arrows above their heads, whereas red icons denote that they know exactly where you are. In those cases, if you break line of sight for long enough, they’ll lose track of you. Helpfully, the game shows you an outline of your last known position. Generally, taking up higher ground is a great way for enemies to lose track of you. But if you do get caught, it’s not the end of the world. Just make sure you kill any orcs who are about to sound the alarm (denoted by flashing icons over their heads). You can actually get pretty close to orcs before they notice you. Sometimes, you can run right by them without raising a fuss. And when an orc does see you, there’s usually still a split second window to nab a stealth kill, so be brazen. Mind controlling orcs is a great way to stage an attack. It’s all free muscle. It’s a good idea to dominate archers surrounding an area of interest, so they can back you up from on high. The higher your combo, the more damage you do, so there’s plenty of reason to keep a chain going. Don’t just mash the attack button, though. You should also pepper in special moves, such as executions and consumption, to maximize damage while also maintaining your health. All while countering whatever you can, of course. Remember, orcs can be grabbed and pushed. You can shove an orc into a fire, which will light it up, or you can throw them into larger groups of enemies to give yourself some space. You can also shank enemies while holding them. If an orc falls to the ground, you can perform a special execution. Low on health? Run away! There’s no shame in it. Actually, it might make your game more interesting, because Captains will remember your cowardice and rub it in next time. Sometimes, you can book it to a part of the map where nobody has seen you yet and just steal health from an unsuspecting orc. Messengers in particular can be consumed faster than all other types of orcs. And if you’re dangerously low on health and out of options, remember that you can always sap HP from rats. Death comes for us all. When it happens to you, it’s never a bad idea to track down the orc who did you in. They’ll have specific lines about you now, and if you beat them, the game will award you better gear. If you look at the map, you will see red icons. These are usually special events, such as hunts and trials. No better way to see the nemesis system first-hand than to mess around with important orc events like these! Captain orcs are worth killing for better gear, but you shouldn’t slaughter all of them. Make sure to dominate a good chunk of them, too, because you’ll need to appoint your own crew at castles at the end of each section of the game. Getting some extra orc buddies is a good idea, because they can permanently die even under your watch. Whenever you’re in a new map, some routine will make things more efficient. Look at your army menu. Find out who the war chiefs and associated bodyguards are. Then, get some intel. Most camps will have a handful of knowledgeable orcs walking about. Dominate them, and make them reveal stuff on bodyguards first. Kill the bodyguards first. Then, go after war chiefs—the battle will be easier once you dispose of the bodyguards. Then, appoint your own orcs at the top of the pack. If done correctly, castle sieges should be a piece of cake. Okay, this is a weird mechanic for a video game to have, but it’s useful. Threatening an orc via intel messengers will automatically raise their level and combat acumen, but they also drop better gear. It’s worth doing every once in a while, as strange as it is. You can tell a captain to kill another captain. Actually, you can send multiple orcs after the same target. If they’re successful, your allies will gain levels. You can even tag along to help, or watch proudly from the sidelines. Fighting pits are a great way to level your orcs. If you want to get the bonus ending, you’ll want to make sure all your war chiefs match your level, so you have less grinding to do once the game gets tough. Just make sure to pay attention to the enemy’s strengths and weaknesses, too: you don’t want to send an ineffective orc into battle. They’ll die! That said, if an orc who should have been evenly matched gets killed here, don’t get too mad. All it means is that you’ve found a better orc. You can just jump into the fighting pit afterward, get their health low, and dominate the orc. Tada, instant upgrade. Found a particularly fantastic orc? Give them a training command under the army menu and make them your bodyguard. You’ll be able to call upon them anytime. Just make sure to keep an eye on their health when out in the field, and to revive your buddy if he ever goes down. Oh, and make sure to give your war chiefs some bodyguards too. Basically, you can never have enough bodyguards. Caragors, Graugs, and Drakes are all wonderful tools that you can crush your enemies with. Monsters also give you better/different mobility options, so try them out. Many pieces of gear have challenges that unlock things like status effects and higher critical hit chances. You can view challenges by looking at your inventory, and a single button press will track the challenge on your HUD. Once completed, make sure to go back into your inventory and spend the Mirian necessary to equip the effect. Gem runes are dropped by treasure orcs, which are denoted by white icons above their heads. Different colored runes pack different effects, from added damage to more armor. You can also forge three of the same type of gem together to get a better gem, so keep track of how many gems you’ve collected. You can find them on the far right icon under the Quests menu, and they’re usually pretty fun to do. If something seems like a drag, you can just replace the challenge. Challenges will reward you with things like gear, Mirian, and even gold coins, so it’s all worth doing. With rewards like permanent skill points, there’s no reason not to do these quests. Shadows of the Past missions also teach you how to play the game more effectively, which is great. Don’t make the mistake of setting a quest, and then bringing up the map and findinding where you need to go. You can fast travel to any map directly from the place where you set an active quest. Vendettas and castle sieges are a blast. It’s really cool to see what orcs have bested other players, and it feels good to take down something you know gave someone else some trouble. It also feels awesome to take down a castle set up by another player, because you know someone specifically constructed it that way. Even if you don’t have a competitive streak, multiplayer is worth dabbling in for the rewards: you can get special loot boxes and chests here, as well as good gear. You don’t need them. You should only get a loot box if the game naturally awards it to you, either via daily challenge gold or by participating in the multiplayer.